Anyway, Lumidee is back and I can almost hear your sighs of relief across the webwaves. In fact, thank god she has returned to us in these ‘Beyonce having become a bizarre mash of Tina Turner and Diana Ross’ days. And she is back with something rather odd – She’s Like The Wind. Yes, everyone’s favourite weep-a-thon Swayze classic from the ditzy Dirty Dancing has been reworked into a soulful grinder- with Lumidee joined by Tony Sunshine – ripe for overplaying on Radio 1. // So far what im hearing look I like the sound . What?? p.s. Can someone explain to me how Cascada keeps getting top 10 hits? Have we travelled back to 2001? Are the charts accidentally only counting sales in the North West? Mika was astounding at Popstarz. Various people have accused him of miming but I can confirm he was live. In any case I can’t really pay much attention to Mika when his drummer is on stage with him. Last time I saw our #1 at Ronnie Scotts, I stared and stared at his drummer for ages wondering why I knew her. Then I got home and thought ‘huh maybe she’s the drummer for The Faders‘, and then dismissed it thinking I was only thinking that because she was a a girl, black and a drummer. But no, I was right! Mika’s drummer is Cherisse Osei, formerly of short lived girl band The Faders. They were to the UK what The Like are to America in terms of having famous parents. Hooray for fact based (rather than race based) deduction! Anyway Cherisse totally rules when on stage with Mika – she was born to be a star. Even if that birth was an offensive 1986 one. 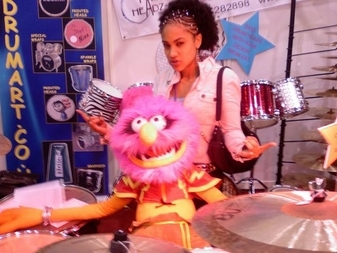 Cherisse passed grade 8 drums at 15 and got her first kit when she was 3. She started out in a heavy metal band called Fuse and her first gig was a Muse concert. PERSONAL FACT: I passed Richard Blackwood at work yesterday and gave him a totally starstruck face. 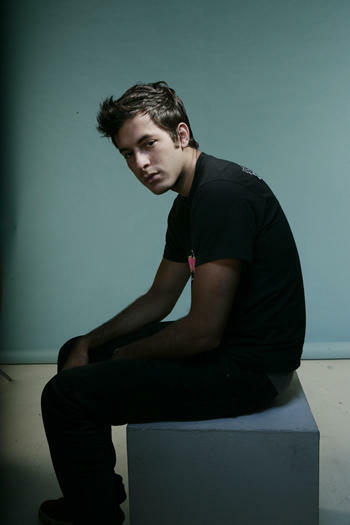 The Faders debut single No Sleep Tonight was used on Veronica Mars, one of my favourite TV shows. She is like totally BFF with someone gaypop would pay good money to snog. These are probably enough facts for someone you’ve probably not heard of. However I hope to be doing a mini interview with her for F*@K Magazine if she says yes. What form this will take I do not yet know but hopefully she wouldn’t google my name and find this slightly stalkerish post. F*@K is a new gay magazine set up by the gods behind ghetto and popstarz by the way. It’s totally ace and I’ve so far contributed a Fischerspooner interview (in issue 2) and have a Charlotte Hatherley and Maximo Park piece in forthcoming issue 3. Ace. Cherisse for #4! Just a quick note to say it is really really cold in London, particularly in my bedroom where my stupid sash style windows appear to be letting in all air possible. GRRRH. Does anyone have an opinion on music festivals to try in Europe? I’ve already done Exit (woo!) and Benicassim (boo!) and am thinking something Scandavian as I’d quite like to see a lot of Scandavian pop acts. My Maximo Park interview went well. Paul even sang a bit of Billie down the phone to me. My life couldn’t be more complete. So remember how I love Annie? She’s a Norwegian DJ and pop singer whose debut album Anniemal was released on 679 [who may I point out have signed Dead Disco! ], had a pretty big push from the label and was dug by lots of bloggers and critics but no-one who would actually use a shop to buy it. Well today, Universal Records signed her for a UK deal. She’ll be working with Xenomania to make an album which’ll be out at the end of 2006. Yippee. I wrote more on the subject over here. As John Legend would say Holler holler holler! I have just been given short notice that I’m interviewing Paul Smith from Maximo Park in the morning. to see Client at Nag tonight leaves me with little time to prepare. questions that I’d be stupid not to ask please hand them over. In return I’ll tell a good pop fact. 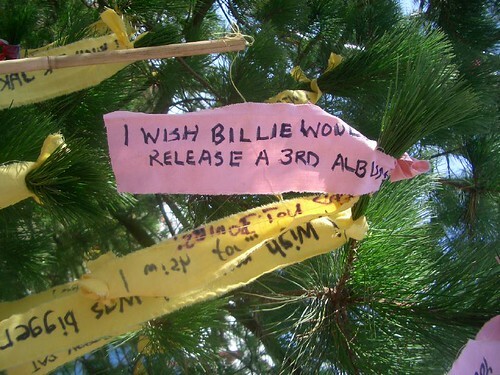 My wish on the wishing tree, originally uploaded by trixie. 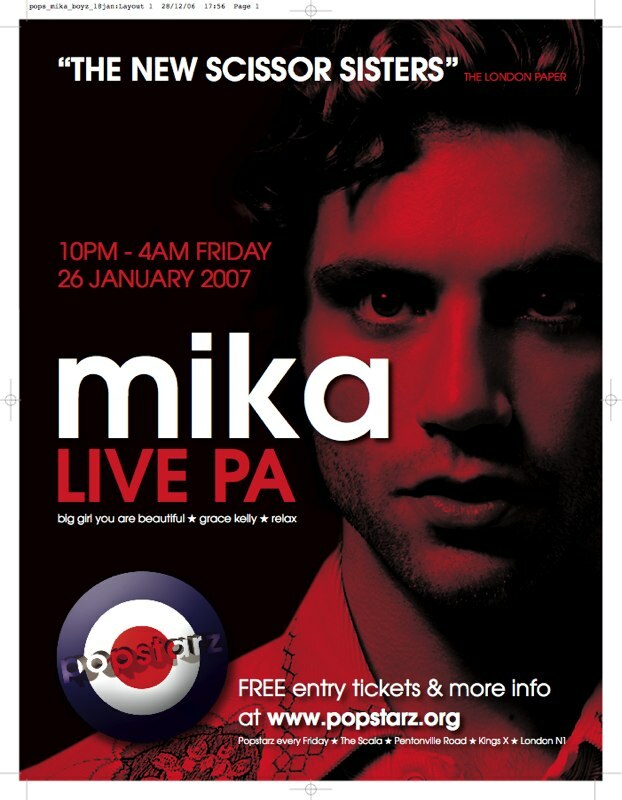 In what is perhaps the booking of the decade, Mika, currently set for this week’s #1 slot on downloads alone is playing Popstarz next Friday (26th January). Woo hoo. And while the battle for #1 between Mika and Just Jack, never mind the entire exciting chart of last week (seriously klaxons downloads only at 15? WHAT?) should be spoken about, I’m far more excited about the re-entry into the charts of our glorious leader of pop – Billie Piper. I’ve not heard it myself, but Chris Moyles has been running a campaign to get Billie’s 4th single Honey to the Bee back into the charts to demonstrate the flexibility (exploitability?) of the new charts. Why he’s picked this song I have no idea, after all it’s totally her 4th best single falling way short of Day and Night, Something Deep Inside and She Wants You, but who am I to argue? The public seem to have picked this campaign up and run with it with a current iTunes chart position of 15. Whether this translates into a real top 40 placing is yet to be seen but wouldn’t it be fabulous if it did? After all we’re never going to get any new Billie pop material. Buy, buy, buy. I listen to a lot of music. Some of it is pants, some of it is good. it, play it at clubnights and generally think ‘huh, that’s good’. place, wrong tracks are played and everything sounds really shonky. The music, of course, is brilliant. ANYWAY we all know Mark Ronson is really cool don’t we? In November 2003 he made his first impact to the masses with the astounding Oooh Wee which sampled Boney M’s Sunny (before the Boogie Pimps) and featured Ghostface Killah and Nate Dogg amongst others. The track was taken from his debut album ‘Here Comes The Fuzz’ which I’ve not actually hear. I assume it is great though and must try to listen soon. In 2006, Mark Ronson really reappeared on my radar producing large parts of three of my favourite albums of the year Back to Black, Alright Still and Rudebox and putting in an amazing performance at Bestival. We also got a single release from him in the form of an ace cover of Radiohead’s Just. This was a teaser for his 2nd album Version which’ll be released on April 16th and features reworkings of famous tracks in that horn-ridden, groovy way of his. I’ve heard a few tracks from Version and particularly love Lily Allen’s version of Kaiser Chiefs’ Oh My God but today, in this radio show, I heard a spectactular version of one of my favourite Smiths’ songs: Stop Me If You’ve Heard This Before. The thing with Mark Ronson produced tracks is that they’re generally brilliant but they occasionally fall into the COMEDY HORNS label (as Just does a little). I’m No Good uses the horns to a slightly less comedic effect and Stop Me does the same. Vocals are provided by Australian Daniel Merriweather and it even blends the Supremes You Keep Me Hangin’ On in at the end. Of course, every other pop blogger under the sun has already written about it, but as ever XO London in the most concise, brilliant manner. And I agree with him entirely, it makes me want to run round my room screaming too – oh the breakbeat bassline, the silky smooth vocals and the unbearably, oh so yearning strings building and building and building. XO alerts me to the fact that you can hear it in full at Mark’s Columbia page. So go, go go go this instant and listen to what is perhaps 2007’s Crazy. I’ve been sitting there on repeat for at least the last 4 hours.